The Rosa’s House of Culture is about constructing counter-public at the moment of closure of publicness. This project is questioning the legacy of Soviet tradition of Houses of Culture which was a well-spread state supported infrastructure for leisure and educational activities of people in Soviet Union. What can we learn from that experiences and how can we imagine a new model of House of Culture in composing a counter-public sphere? How this places could “function as spaces of withdrawal and re-groupment and/or as training grounds for agitational activities directed toward wider publics” (Nancy Fraser). For realizing this research and praxis we have decided to establish an experiment in operating a space where members of different marginalized leftist collectives invent and maintain their activities, which in turn permit them to shape and defend their identities, interests, and needs and how this different groups could come together and mutually support each other at a dark times. The main function of this space is to bring these diverse groups into dialogue which could lead into building of a new composition of solidarity and engagement into common mutually supporting activities. Еxploring Houses of Culture as spaces where different emancipatory encounters with art and culture happened, the project aslo involves investigating how these experiences can be translated into current day counterculture practices. The Soviet Houses of Culture were popular institutions in the Soviet Union, created as public spaces to engage workers in various life-building programs. Their genealogy can be traced back to nineteenth-century Italy, when similar spaces formed out of workers’ desire for literacy. In their theoretical studies, Chto Delat trace another important parallel between the Houses of Culture and early avant-garde experiments such as Alexander Rodchenko’s Worker’s Club; institutions such as social centers; and contemporary museums’ public and educational programs. At the center of the current investigation is a reappraisal of the role these institutions have played and an examination of how the activities and training courses have been key for several generations of independent artists, including some of the members of Chto Delat. 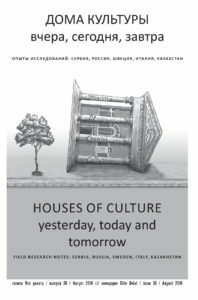 Another important aspect of the project is to look at how the Houses of Culture have contributed to the emergence and development of self-organized initiatives, such as DK Rozy (Rosa’s House of Culture) in St. Petersburg, which was founded by the group as a practical outlet for their theoretical propositions. Faithful to their belief in the power of collective work, Chto Delat have selected a group of fourteen young artists, many of them graduates of the group’s School of Engaged Art. Each artist selected and researched a variety of Houses of Culture in towns and cities across the former Soviet Union, operating from the early twentieth century to the present day: St. Petersburg, Arkhangelsk, Korkino (Chelyabinsk Region), Kaliningrad, Omsk, Novosibirsk, Kara-Zhygach (formerly Ala-Too, near Bishkek, Kyrgyzstan), Togliatti, Shelota (Vologda Region), Jõhvi (Estonia), Minsk (Belarus), and Gorodnya (Tver Region). The choice of the House of Culture was informed by each artist’s personal interests and experience. Their stories and discoveries show how the remains of Soviet infrastructure have influenced the development of the post-Soviet intelligentsia. An entire section is also dedicated to three successful artist-run initiatives, in Moscow (DK Delai kulturu); Novosibirsk (kakoe na dne?…); and St. Petersburg (DK Rozy). The emergence of such projects today points to a growing need for new public spaces where the audience can interact with art in a different, more open-ended way and be involved in its production, with such initiatives providing a counterpoint to the current consumerist approach to culture. dk-rosy_musa1 from chto delat on Vimeo. Since September 24th 2015 ROSA’s House of Culture is forced to stop its public activities in the ArtMuza space. The reason: as we were told in the directorate of ArtMusa, they had received “the signal from the FSB,” and because they are not going to risk their bussiness, they unilaterally break the lease. Naturally, this is against the law. Comments: Our House of Culture is an educational and cultural center, which aims at the formation of critical thinking among artists, cultural workers and activists interested in the analysis and the participation in the processes of change in society. An important part of the public program of the House of Culture have become topical social projects, raising important issues such as the round table of doctors and patients of the closing emergency department on Vasilyevsky Island. We did not do anything illegal – we did not distribute forbidden literature, did not carry out violence and did not call for it, and there are no regulations on the recognition of our activities as extremist or even undesirable. We believe that the termination of the annual lease agreement from the Art Musa, is an act of self-censorship that permeates our entire society. We decided not to challenge it in court as management cluster has all the capabilities to legally paralyze our public works, which has already started to happen, when the guards of Art Musa allowed themselves rude and incorrect behavior in relation to the project participants and our guests. Therefore, instead of litigation with ArtMuza we prefer to mobilize our resources to find a new space, and are confident that ROSA’s House of Culture will open in October in a new place with an even more intense and important program. Why are we looking to the experience of the establishment and development of houses of culture? Why is it important for us today? For us, the Chto Delat collective, this is not an abstract question for scholarly research, but rather speaks to the urgent need to form a fundamentally new context for the development of art. We believe that houses of culture can become places for the formation of a new public beyond the limits of the neoliberal creative class and focal points for the development of political communities of people, ready to produce and defend socialist foundations for culture and art. For that reason, our historical interest has taken practical forms: instead of studying the houses of culture of the past, we decided to open up a small house of culture and see what we, together with other participants, could learn in practice. That is how the Roza House of Culture appeared in Petersburg, and it has since hosted many initiatives and events which otherwise would probably not have seen the light of day. It needs to be pointed out that the idea of houses of culture appeared in Italy in the middle of the 19th century, when workers began to gather together to learn how to read in order to pass a literacy test and be allowed to take part in elections. Later, this idea was energetically developed in Soviet houses of culture, and even after the collapse of the USSR it did not disappear, but was transformed and emerged in new incarnations. We can find traces of it in the new centers of the creative industry: Loft Projects, co-working spaces, leisure and recreation centers, and so on. Today, every shopping mall hopes to house a cinema, a theatre, and children’s play areas. Many art institutions are increasingly integrating the functions of houses of culture within themselves, with their educational programs, libraries, accent on access to marginalized members of the public, etc. All of these contemporary tendencies, obviously, take place in the absence of a political program with any degree of articulation, while in the past, houses of culture were run either by mass socialist movements or by state education policy, as in the Soviet Union and Yugoslavia. Clearly, if we wish today to reclaim the emancipatory and educational function of the houses of culture, it must be a well-articulated project directed against the hegemony of the commercial-consumer relationship to culture and eager to assert its values and show the possibilities for their actualization. The political purpose of the new houses of culture is to raise, first and foremost, the issue of re-examining and reformulating the new class structure of society, in which we see the potential for the formation of singularities, i.e., new people, ready at a given historical moment to defend the values of an emancipatory politics and rethink the role of culture and aesthetics in processes of emancipation. This is happening in the Zapatista caracoles in Chiapas, and it is happening in social centers around the world experimenting with principles of autonomy and protocols of openness. Autonomy is always naïve, as any micro-project is naïve in the big world of corporate capital, but only autonomy can launch a challenge and present new forms of production communities that disobey the logic of profit. Who are these new people? What are they prepared to fight for? What culture forms are they capable of drawing together and organizing? These are precisely the questions we posed when we opened Roza House of Culture, and they are the questions being discussed inside this publication.